When installing rooftop solar panels, it is important to understand that your new system needs to have a long-lasting, solid foundation. That foundation is your roof. Solar panel systems and roofs have a similar life span of about 20 years, which means there are several things to consider prior to installation to ensure you don’t run into issues. 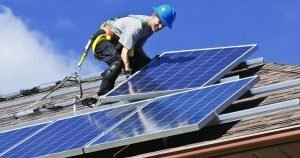 As solar installations continue to grow in popularity, we have run into specific situations where the solar installer and/or customer did not take the roof into account. Here are some common problems to avoid. Ideally, your solar panel and roof life should be a about the same. If your roof only has 5-10 years left, having solar panels installed without treating your roof first is in invitation for trouble. Be sure to hire a professional roofing company to evaluate your roof prior to installation and repair or update your roofing system prior to installation. Your roof should provide the proper conditions for your solar panels to perform well. One example is positioning of the panels. The ideal orientation should be facing towards the West or South get the most sun. Many Arizona roofs, such as tile, are not designed to support the weight of solar panels and the foot traffic required for installation and maintenance. In many cases, installing solar panels requires multiple penetrations of the roof system. This may void your manufacturer’s warranty or go against recommendations for your specific system. The chances of your roof being 100% compatible with solar may be slim but be sure to consult with a roofing contractor, or have your solar specialist work together with them to figure out the best options for installation. All roofing systems should be designed to allow water to flow off the rooftop and away from the structure. If solar panels are installed without careful consideration for this, wiring and/or racks could potentially impede this flow and prevent it from draining properly. If water is forced upward, this could result in roof leaks. Roof repairs after panels have been installed can be much more difficult so be sure any issues get addressed right away. Be proactive and preventative versus reactive! Good roofing systems are durable, but they all have their limits. It is important to hire an installer that understands the needs and nuances of your roofing system and takes them into consideration as they perform their installation. The last thing you want is an installer dragging items across your shingles, puncturing or penetrating your membrane. Any debris left behind can clog drains and cause issues as well. Best practice is to perform annual maintenance and roof inspections, even without solar panels. Once solar panels are installed, that practice becomes less of an option and more of a necessity. Your panels’ performance rely heavily on their condition. If you’re not checking up on your roof and panels somewhat regularly, small problems could become big problems. Again, we strongly recommend being proactive and preventative to get the most return on your investment. Another thing to be aware of is the effect birds can have on your roof, especially after solar panels are installed. They love the protection of the panels. You may not have a problem before the installation but once solar is installed birds may roost under the panels causing multiple problems to both your roof and solar system. Their acidic droppings ruin the integrity of your roofing material. Accumulation of bird droppings, feathers and nesting material can cause a damming effect which can cause the water to back up into the roof. Some solar companies will automatically add rodent barriers while others will only add it after the installation and a problem develops. If you notice a problem, call your solar company but a regular roof maintenance plan could help catch an issue before it turns into a costly problem. Solar panels and roofing go hand in hand. Jim Brown and Sons have the experience you need to ensure your solar panels are installed properly and on a quality roof system that will work harmoniously with your green energy investment. We are happy to work with the solar installer of your choice to make sure your project goes smoothly. Contact us today if you have any questions!